Are you looking for this Breach Notification to send to the data subjects in case a breach happened? Download this letter draft directly. 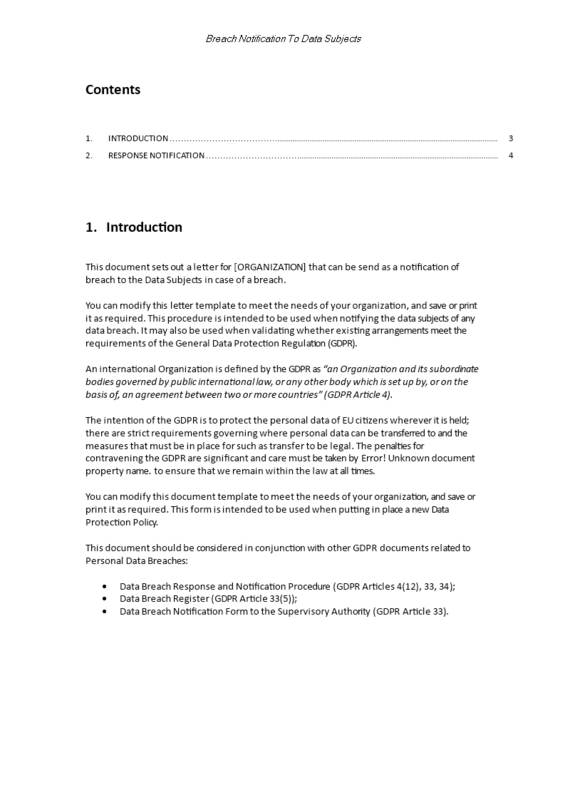 This document sets out a letter that can be sent as a notification of personal data that was leaked to the Data Subjects in case of a breach. The EU General Data Protection Regulation (GDPR) is the most important change in data privacy regulation in 20 years. This policy directive was adopted in May 2016 because most Europeans say they want the same data protection rights across the EU and regardless of where their data is processed. It aims to make Europe fit for the digital age. Download this Breach Notification to Data Subjects now or check out our fit-for-purpose GDPR Complete Compliance Kit templates here! The document(s) will be available to download immediately after purchase.